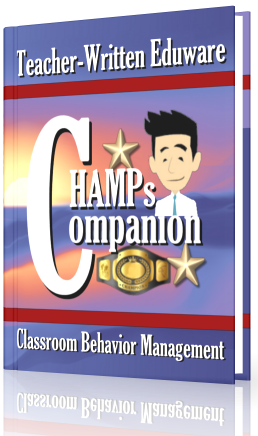 CHAMPs Companion is a compelling and operative way to inaugurate an effective, proven, behavioral management system in the classroom—particularly in the middle of a school year. 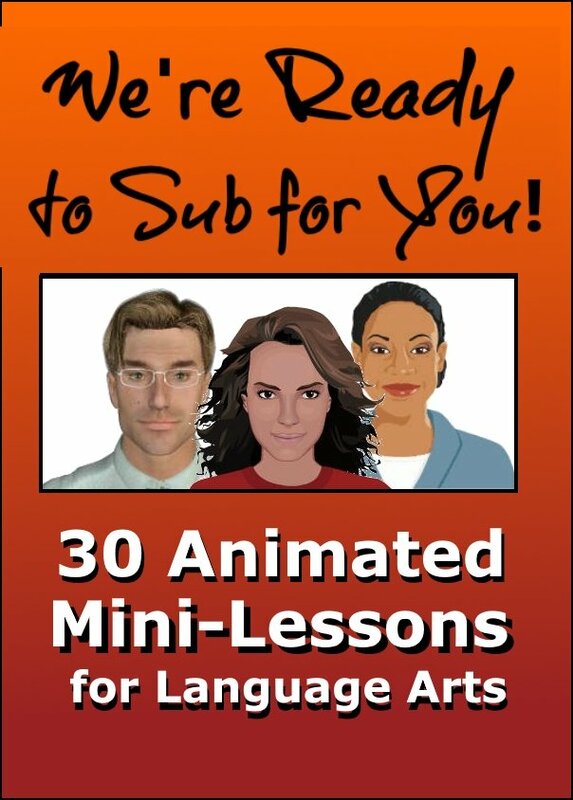 This 18-20 minute animated video book introduces the CHAMPs Classroom Management System to students. 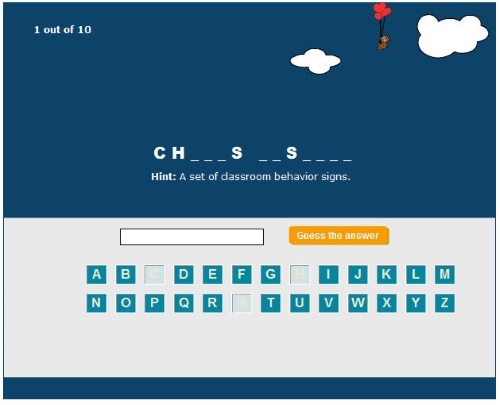 The video book uses examples drawn specifically from the 100 CHAMPs Classroom Signs collection; however, if you use your own set of CHAMPs signs, you'll likely find that this resource is just as useful. Who Wants to be a CHAMPs Gazillionaire? CHAMPs Companion also comes with the CHAMPstormer—a specially-formatted, customizable PDF brainstormer. 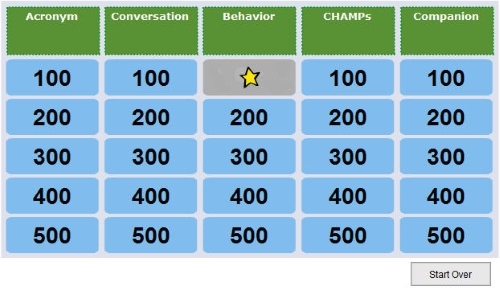 CHAMPstormer is an extraordinary utility for gathering student input in the formulation of activity-driven, behavioral expectations. There are free, downloadable trial versions as well. The graphical user interface looks like what you see below—this is a screenshot from Chapter 2. The animated chapter preview that you will see immediately below is an excerpt from this same chapter. The screenshots that appear in the slideshow below are reduced in clarity (as all screenshots are, for some strange reason). The actual presentation itself is MUCH larger and razor-sharp in focus. With less than a minute per quiz (thus, the name Quick Quiz), students may write answers, raise hands, or the majority of voices rules—that’s entirely your call. Chapter 6, which serves partially as an introduction to the online activities section of CHAMPs Companion, offers two options to you as the presenter. 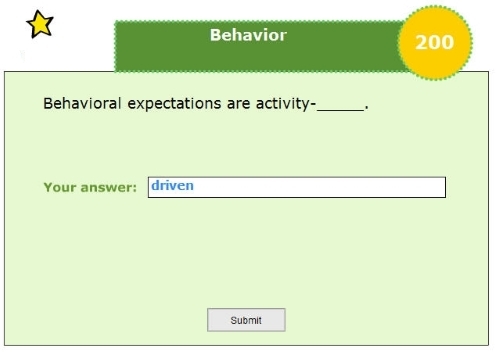 The Predetermined option should be selected if you have already established behavioral expectations for your kids. 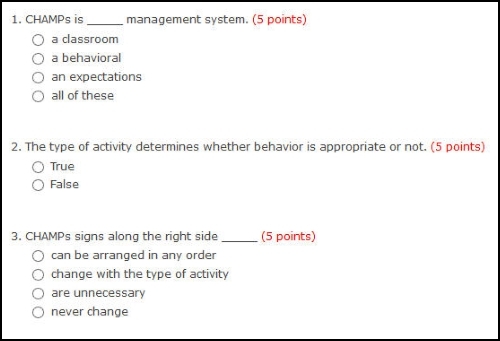 The Student Input option is intended for a class that you will invite to brainstorm one or more sets of behavioral expectations for CHAMPs. This choice, of course, is entirely up to you. The Activities portion of CHAMPs Companion contains 9 review/practice, online choices. These activities are Quia-based-- neither you nor your students have to be members of Quia to participate—just follow the provided links! Whether you allow your kids 15 minutes or 45 minutes for these activities is entirely up to you. 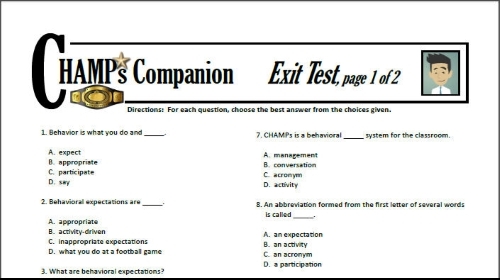 Although students may take the Exit Test online, it will necessitate writing their scores down as they appear on their screens. Two versions of the Answer Key are also included—a complete, highlighted answer key, and a simple, straightforward letter key. 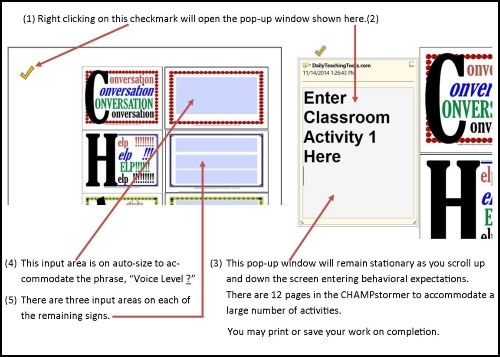 The CHAMPstormer is a brainstorming utility designed to be used with your kids if you wish to include them in the process of developing behavioral expectations for each of your classroom activities (highly recommended). In my opinion, this extraordinary, specially-formatted, customizable utility will be invaluable in the formulation of activity-driven, behavioral expectations. Although the following directions may suggest that it’s terribly difficult to use, I assure you that it’s quite the contrary. Basically, if you can click a mouse and use a keyboard, this will be a delightful piece of cake. This watermarked demo is intended to give you opportunity to evaluate the quality and potential of this approach to introducing CHAMPs to your students. The full version of CHAMPs Companion is just like the demo, minus all of those annoying watermarks. Plus, the 9 Bonus Enrichment Activities, the CHAMPstormer, and two forms of the Exit Test with answer keys are included at no extra charge. If you’d like a proven way to enhance your classroom management system without a load of finger-drumming “training,” CHAMPs may be just what you’ve been looking for. Can I guarantee that this will work? Of course not. I’m just saying that if you can take the time to involve the kids in the process of determining the behavioral expectations for at least a few of your classroom activities, you’ll be amazed at how appropriate and logical their responses are. The CHAMPstormer is an amazing way to simplify and streamline that brainstorming process. 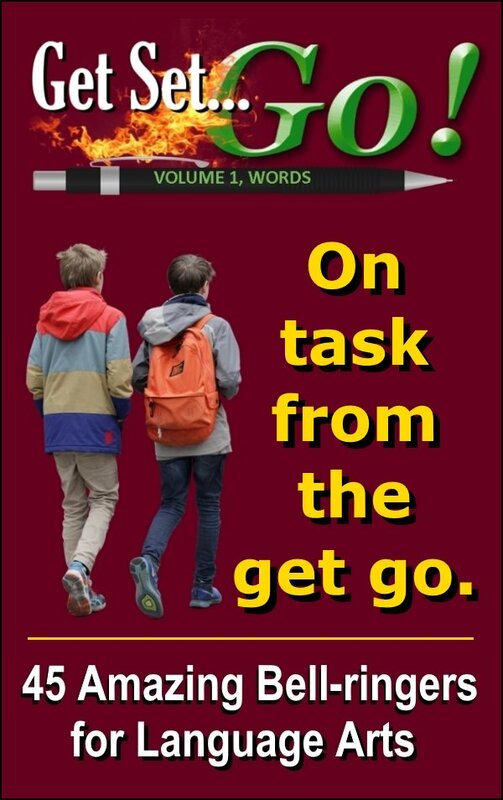 With that and your guidance, the kids will buy into this whole thing—they will adopt their own expectations as the laws of each classroom activity. Best wishes to you as you launch this new initiative! 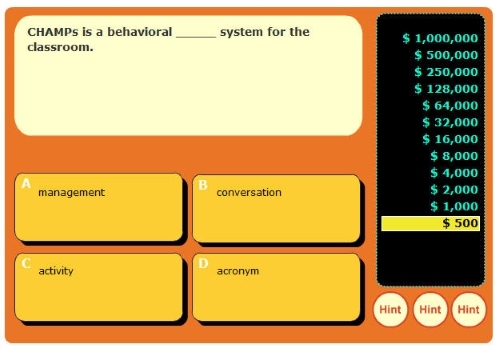 The CHAMPs Classroom Management System itself is the brainchild of Randy Sprick, Ph. D. (and others) at Safe and Civil Schools Classroom Management (see http://www.safeandcivilschools.com/services/classroom_management.php). As was true for the 100 CHAMPs Classroom Signs Collection, CHAMPs Companion features several clipart works from Phillip Martin, who in my humble opinion, is a superb classroom artist.